Public Market. Arts District. Plus all the cool restaurants are opening up here. Between 1923 and 1997, tens of thousands of sailors went through boot camp and training at Naval Training Center San Diego. Today, all the hip restaurants are opening up at Liberty Station, an arts and culture center. Stone Brewing World Bistro & Gardens Do you love craft beer? Welcome to San Diego’s largest restaurant with indoor and outdoor dining areas, a bocce ball court, outdoor cinema space and garden. Of course, you can count on 40 taps of exceptional beers including Stone special releases and world-inspired cuisine. Public Market The only thing we can suggest: bring a couple of shopping bags! Seven days a week you’ll find the best and freshest foods, fish, produce, beer, wine, and cocktails, as well as local art vendors. Do your shopping for the week or stop by for lunch. Moniker General This might be heaven: home goods, custom furniture, and craft coffee all one place. Enjoy coffee and toast at Moniker Coffee and crafted cocktails, wine, and beer at The Bar. Then be sure to browse the intentional, handcrafted merchandise. Breakfast Republic Breakfast is the most important meal of the day. And Breakfast Republic delivers with twists on American classics such as Oreo Pancakes, Chicken Wing Breakfast Bowls and S’mores French Toast. Oh, and the coffee. Pizza at Bueno Forchetta Officine Buona Forchetta serves up Italian delights and regional specialties and is popular with the entire family. Why? Kids can run free on the playground and enclosed running area while Mom and Dad savor fresh pizza. Genius. Yoga Six Point Loma Get your omm in. Choose from more than 15 classes a day including Tap into the intelligence of your body and drive toward a stronger more whole self. You can even rent a towel and mat if you’re running late! The Lot Going to the movies redefined. Recline back in a luxury twofer seat and enjoy your choice of craft coffee, artisan pastries, elevated cuisine, premium spirits and sophisticated wines to go with your blockbuster. Trader Joes The place to stock up on all your favorites. Produce. Tortillas. English muffins. Frozen burritos. The wheat pretzels. The yogurt. Frozen naan. Hummus. Wine. Beer. Cards. Fresh flowers. Aloha! Con Pane Rustic Breads It all begins with the bread! Con Pane Rustic Breads offers traditional artisan breads, breakfast pastries, inventive sandwiches, locally roasted coffee and espresso drinks in a warm, inviting cafe. Arts District The first Friday of every month from 5:00 pm to 9:00 pm, Friday Night Liberty is San Diego’s biggest monthly art walk! Meet working artists, enjoy dance, theatre, and music performances, visit museums and galleries and explore the growing District. Tide Pools At low tide, water gets trapped in pools among the coral and rocks, giving you the opportunity to see crabs, starfish, and other seal life. Be sure to check the tide charts before a visit: viewing is best from two hours before low tide to two hours after low tide. Bayside Trail The two-mile coast trail offers stunning views of downtown, the harbor, and the Coronado Bridge. At the top of the path, you’ll enjoy views of ships making their way to the harbor. If you’re lucky, you might catch an aircraft carrier returning to port. Surfing at Sunset Cliffs If you have to check a map to find these surf breaks, you probably shouldn’t surf them. Sunset Cliffs is for expert surfers. 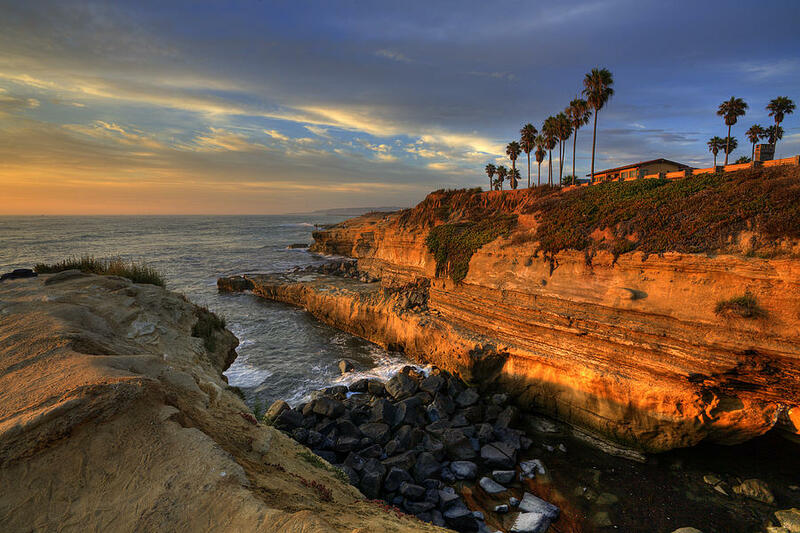 For the rest of us, enjoy a walk along the Sunset Cliffs Blvd. and enjoy the views of the surfers and panoramic ocean vistas. So much more than SAILBOATS! Fathom Bistro, Bait, and Tackle It looks like a bait shot, but it’s San Diego’s only tap house on the water pouring your favorite craft beers. And the sausages are made right here: bierwurst, spicy Italian, chicken basil, and chicken pot pie sausage! The Boating Life The best friend you can have is someone who owns a boat. If that’s not the case, there are plenty of places where you can rent a sailboat. You can even join a local yacht club as a social member and learn to sail. Sports Fishing If you love sport fishing, you’re in luck. Boats leave daily on trips ranging from half a day to three weeks. Better Buzz Coffee Better Buzz Coffee might be our favorite place to begin morning at. People come for the coffee and stay for breakfast with favorites including OG acai bowels and avocado toast. Point Loma Seafood This Point Loma institution is the “the freshest thing in town.” Seasonal fish is bought directly from local fishermen, so you’ll enjoy the freshest seafood shrimp and crabmeat available in the area. (And we love the chowder.